So how can a picture frame or candles make a rewards collection more socially responsible? It all comes down to where these to products come from. The picture frame is a really unique way to dip your toe in the CSR water. Even though it's a rustic brown color, it's certainly a great example of a "green" product. The 4x6 inch frame is made from recycled bicycle chain. What's more remarkable about it is how it's made. The Bicycle Chain Frame is created by a social enterprise group out of India called Noah's Ark. Artisans working for Noah's Ark receive benefits such as training, education and medical treatment for artisans and for their families. Money made from frame sales goes back towards making the artisan communities more self-sufficient. 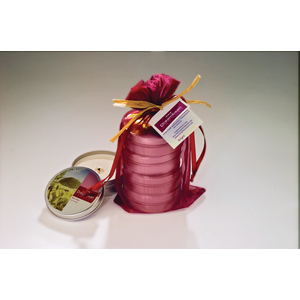 In the same way, Dreambean Candles also help those less fortunate more self sufficient. The Deeper Dreambean collection offers candles made from a high quality soy wax and fragrant oils. Poured into round, three-inch tins, the candles can be easily packed for a weekend getaway and has a burn time of around 45 hours. Made by Bright Endeavors, each candle sale goes to help support training, mentoring and eventual job placement for homeless or other at-risk women in the Chicago area. Sometimes the smallest things - like candles and picture frames - are the ones that make the biggest difference.